Greek 328-320 BC, Alexander the Great drachm in 14k gold bezel on silver bracelet. 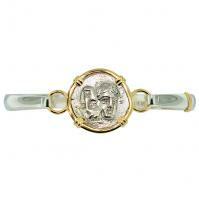 Greek 400-350 BC, Gemini Twins of Istros drachm in 14k gold bezel on silver bracelet. 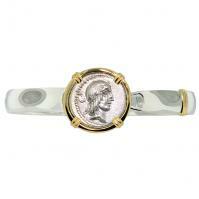 Roman Republic 120 BC, Janus & Roma denarius in 14k gold bezel on silver bracelet. 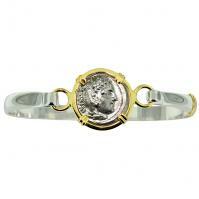 Roman Republic 90 BC, Apollo denarius in 14k gold bezel on silver bracelet. 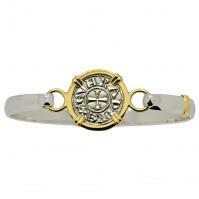 Italian 1139-1252, Crusader denaro in 14k gold bezel on silver bracelet. 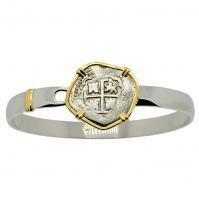 Japanese Shogun 1859-1869, gold Nibu-Kin in 14k gold bezel on silver bracelet. 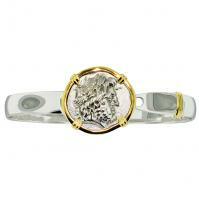 Holy Land 103-76 BC, Biblical Widow’s mite in 14k gold bezel on silver charm bracelet. 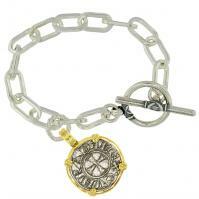 Roman Empire AD 330-346, Constantinopolis & Victory follis in 14k gold bezel on silver charm bracelet. 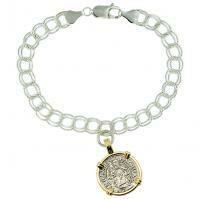 Roman Antioch AD 337-340, Constantine the Great follis in 14k gold bezel on silver charm bracelet. 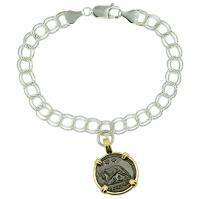 Roman Empire AD 335 - 337, She-Wolf Suckling Twins nummus in 14k gold bezel on silver charm bracelet. 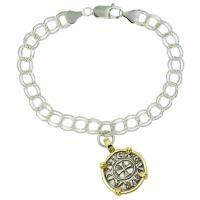 Italian 1139-1252, Crusader denaro in 14k gold bezel on silver charm bracelet. 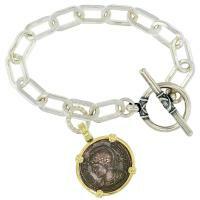 Hungarian dated 1536, Madonna and Child denar coin in 14k gold bezel on silver charm bracelet. 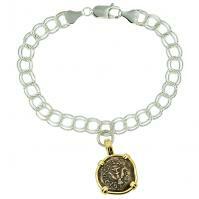 Greek-Egyptian 74-73 BC tetradrachm, in 14k gold bezel on silver bracelet, Mediterranean Sea shipwreck. 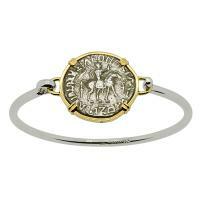 Greek 57-35 BC, King Azes I & Athena tetradrachm in 14k gold bezel on silver bracelet. 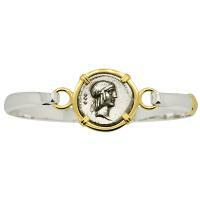 Roman Republic 90 BC, Apollo and Horseman denarius in 14k gold bezel on silver bracelet. 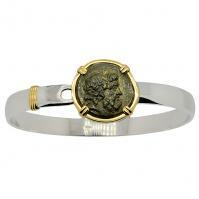 Greek 120-70 BC, Zeus & Eagle bronze coin in 14k gold bezel on silver bracelet. 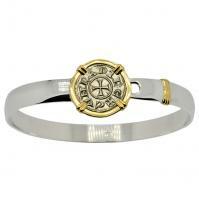 Greek 196-146 BC, Zeus & Athena Stater in 14k gold bezel on silver bracelet. 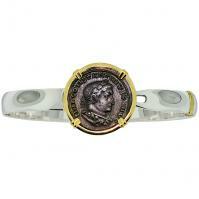 Roman AD 310–317, Constantine the Great & Sol follis in 14k gold bezel on silver bracelet. 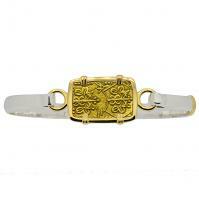 Colonial Spanish Peru, King Charles II two reales dated 1697, in 14k gold bezel on silver bracelet. Included With Your Treasure Order! See Everything That's Included With Your Treasure Order! 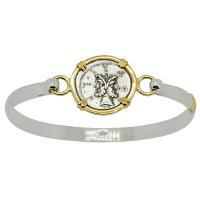 Every treasure item offered on our website is absolutely genuine and has our Lifetime Guarantee of Authenticity. 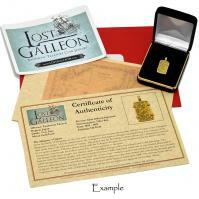 Each piece comes with an informative color Lost Galleon photo certificate of authenticity with a treasure area map. Lost Galleon is continuously striving to offer our customers the greatest quality, selection, and value in fine handcrafted treasure coin jewelry to be found anywhere! Copyright © Lost Galleon. All Rights Reserved. Free shipping is sent via USPS Priority Mail (est. 2 - 4 business days) and applies to all orders over $75. The Lost Galleon Free Shipping in the USA special applies to all 50 States but does not include other US Territories.